One of my favorite past times is to ask "old" people about their lives. I am always amazed at some of their stories. The things recounted to me by these heroes of the "good ole' days", are not always the peaceful times of swimming holes and fishing trips, but usually the tragedies that came their way and how they coped with these experiences. Another thing I have noticed is that no one is unchanged from these events. A person allows themselves to be shaped by their experiences. They can choose to either become hard and calloused or soft and kind. 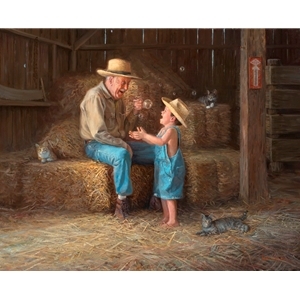 In "Pure Delight" I had the privilege of painting one of those men who didn't have it easy growing up, but he allowed the "stuff of life" to make him a gentler man, able to enjoy the delight of his grandson and everyone else around him. I hope he inspires you to find the joy and delight around you.